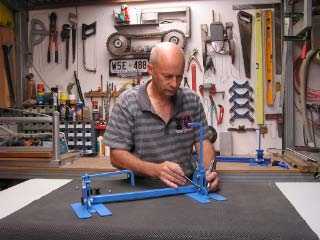 Ezy hang - The inventor Warren Starr in his workshop. My name is Warren Starr and I have been in the Building industry for 30 years. I am currently working for a commercial builder in Adelaide. In my work I have to hang heavy solid core doors and thought there must be an easier way. In my shed at home ( my second home away from home ) I invented the ezy hang door lifter out of steel I had in the shed and I am still using the first one I invented. 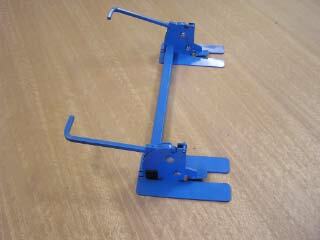 The ezy hang door lifter is now laser cut, assembled and powder coated. The ezy hang door lifter has folding levers for ease of transport and storage. The lifter is capable of lifting to a height of 25mm and lifting capacity of 100kg. If there is a need to lift higher this can be achieved by placing a piece of ply under the base of the ezy hang door lifter. 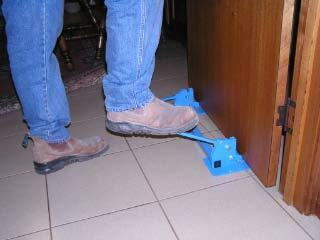 Ezy hang - The door lifter in use. The door is rested on the lifting arms of the two connected levers to lift the door you push down on the levers independently with your foot. The weight of the door is taken by the lifter, and all you need is a guiding hand to keep the door balanced. Ezy hang - The lifting arms shown slightly raised. You can get more information and contact Warren about the Ezy hang here. The email address above is your way to contact Warren, as you can see it is not clickable, but an image. I am sorry but you will have to copy it by hand, as otherwise Warren would very soon get swamped by spam. Another little gadget that I could have used heaps of times in the past. Not just for the lead lined doors that I hung in a few radiology fit outs, but more often solid core doors are used today and they are heavy enough to make them hard to handle. Also where there is a lot of fall in the floor like in bathrooms. Many is the time with a wedge or a chisel under a door I have given the door a bit of a kick with my boot to get it into position, only to find the door skids off the wedge and a nice piece has split of the bottom edge. With the Ezy hang even a rough sod like me should have no trouble. Actually thinking about it, wide access doors in hospitals, fire doors in commercial building, steel faced security or cyclone shelter doors, there are heaps of them that are a struggle for one man. Good on you Warren, best of luck with it. Leave ezy hang and back to home page.